This popular Franco-Russian collaboration, first served in the Russian Embassy in Paris, is sure to impress. Every cook needs a flashy recipe in her back pocket: something located at the tricky intersection of reliable and impressive. It’s the kind of dish to produce when meeting the in-laws for the first time or entertaining the boss during bonus season. Veal Orlov, or “French veal” as the Russians call it, is an excellent choice. Featuring the dynamic duo of veal and mushrooms along with volumes of butter and cream, it’s really hard to go wrong serving this dish. 1 lb. of white button mushrooms, stems removed and finely minced. ¼ cup hard Swiss cheese, such as Gruyere. 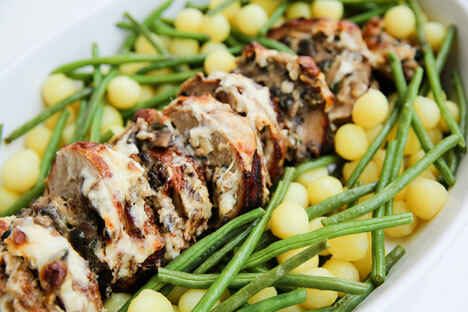 Veal Orlov was invented by French chef, Urbain Dubois, who was working at the Russian Embassy in Paris when it was headed up by Prince Nikolai Orlov. Orlov was a descendant of the famous Orlov brothers, who played a crucial role in bringing Catherine the Great to power in the 18th century. Interestingly, an Orlov currently serves as Russia’s ambassador to France, and I feel sure that this rich and indulgent dish makes a frequent appearance. The recipe below is a slightly simplified version of the classic. Although the recipe has several stages and multiple ingredients, the soubise, the duxelles and the Mornay sauce can be prepared ahead of time, which I highly recommend. I’ve also added the step of brining the veal, which is very lean and therefore can dry out quickly. Brining prevents this, as well as infusing the meat with more flavor. Serve Veal Orlov with new peas, haricots vert, new potatoes, or rice. 1. Tie the veal roast into a roll and soak in the brining solution for at least 1 hour. Pat dry and allow the meat to come to room temperature. Salt and pepper generously. 2. Preheat the oven to 325°F. Melt 2 Tbsp of the butter and the olive oil in an oval-shaped Dutch oven. Brown the roast on all sides for 3-4 minutes. Remove veal to a platter. Drain off all but 2 Tbsp of the fat, reduce the heat and melt the remaining butter in the Dutch oven. Add the onion, carrots, and celery and toss until they are coated. Nestle the veal roast among the vegetables and bouquet garni and pour the wine/water around it. Bring to a gentle simmer, then cover and braise for approximately 75 minutes in the oven until a meat thermometer reads 145°-150°F. 3. Transfer the veal to a platter and tent with aluminum foil. Let it rest for 30 minutes. Strain the braising juices and reserve. 4. Cook the rice for 5 minutes, then drain and set aside. Heat the butter in a sauté pan and slowly sweat the onions until they are very soft. Add the stock and rice, cover, and cook for one hour on very low heat or in the oven with the veal. 5. When the soubise is fully cooked and most of the liquid has been absorbed, puree it in a food processor fitted with a steel blade. 6. Duxelles: submerge the dried mushrooms in the Madeira and 1/3 cup of hot water and let stand for 25 minutes. Remove the mushrooms with a slotted spoon and strain the liquid through cheesecloth and set aside. 7. Melt the butter in a sauté pan, add the shallots and sweat, then gently cook the mushrooms until they leach, then re-absorb their moisture. Stir in cream and simmer gently until the mushrooms absorb the cream. Adjust seasoning by adding salt and pepper. Set aside. 8. Make the Mornay Sauce: Combine the reserved braising liquid and Madeira, and top up with enough milk for 3 cups of boiling liquid. Melt the butter, and then add the nutmeg and cayenne pepper. Use a metal whisk to combine and brown slightly for 2 minutes. Add the liquid in a slow but steady steam, whisking vigorously to ensure that the mixture is free of lumps. Add the grated cheese, combining thoroughly. Dilute with cream if necessary. 9. Assemble and cook the veal: Preheat the oven to 375°F. 10. Slice the roast into ¾-inch pieces and lay them out on a cutting board to facilitate re-assembly. 11. Add the soubise to the duxelles. Spoon or pipe the mixture in between the veal slices leaving some of the stuffing exposed. Use a wooden skewer to hold the slices together on a buttered roasting pan. 12. Heat half of the Mornay sauce and carefully coat the veal and stuffing. Bake for approximately 25 minutes. 13. Serve with the remaining Mornay sauce. Jennifer Eremeeva is an American author based in Moscow. She is the author of Lenin Lives Next Door: Marriage, Martinis and Mayhem in Moscow, available from many online retailers. To find out more about Jennifer, visit jennifereremeeva.com. Note: here is the best link for the book if online.